The Garmin nuvi 54LM is one of the company’s 2013 Essential series models, and while considered an entry-level device, it includes features such as speed limit display, junction view and lane assist – things that were relegated to high-end models not that long ago. It’s a great choice for someone who needs a basic navigator without the bells and whistles, and it’s got an extra-large 5″ display to boot. It also comes with preloaded maps of the US and Canada and includes lifetime map updates. NOTE: Much of the following is adapted from my hands on review of the nuvi 52LM, which is exactly the same except that it only includes maps of 49 states. There’s not a whole lot new on the nuvi 54LM compared to the previous generation 50LM. I did notice a snappier response in testing the 2013 Essential seriesthough, so it’s quite possible they’ve beefed up the processor a bit. 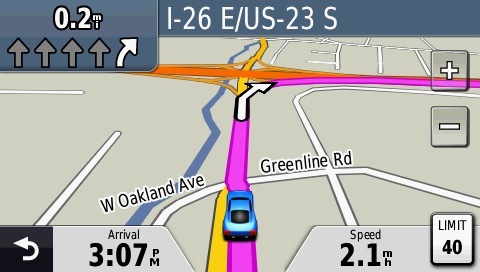 This feature shows you which lane to be in for upcoming turns, as shown in the upper left portion of the image below. Highly recommended. The only trouble I had testing the Essential series was that it wouldn’t connect to the computer once. But after I used it in the car, I was able to bring it in and connect it with no problem. This is a basic navigator but it has all the features most people will need. An improved mounting system and faster processor mark the most significant updates since the nuvi 50LM. Purchased a 54LM Essential series and am told why I can’t add more than one waypoint to a route is because this model is classed ‘Entry level’ therefore I cannot see the point of the waypoint feature on this model. I purchased this model to replace my old 250 thinking I would be getting the ability to add waypoints yes they said but not saying it will only take one. On the basis of this the only advantage is the larger screen, Lane change inset, and spelling correction without having to delete the whole word. Original price £219.99 sale price £119.99. I think the packaging should state this unit is classed ‘Entry level’ featured. or This unit will only accept one waypoint entry. Not find this out after purchase and through Garmin Southampton UK. Not happy knowing its entry level. Perhaps the original price reflects the term ‘Rip off Britain’. I agree, Robert. I bought one yesterday, and will be returning it today. It has already tried to direct me to access a motorway heading north by a junction that was south-only, it doesn’t recognise the existence of my home address (which has been there for decades and was fine on my old Nuvi 200), the pronunciation of streets and placenames is almost unintelligible sometimes, you can’t delete favourites other than one at a time, and “clearing all user data” as per the manual (which you have to access online, they don’t provide one) doesn’t delete favourites either. Worse, it actually reset the favourites to include all of them as per my PC backup – I had to plug it into my PC and access the unit directly to delete the .gpx files in order to ACTUALLY remove my data. It’s easy enough to use, the display’s fairly decent, and the build quality is good, but it really is a let-down in terms of actually doing its job. .Hi Dave thanks for your input you obviously have my thoughts its a crappy overprice model. I expected more than ‘Entry level ‘ seeing a rrp of £219.99 expecting multi way point facility only to find out that is not the case finding on Amazon a model which has that facility at a rrp of around £195.99 and on sale at £95 or thereabouts. The higher priced of the two was one fundamental point of taking on the sale price of £119.99 thinking it had all its ‘Whistles and Bell’s but find it has a comb wrapped in tissue paper to give crap performance of the ‘Unfinished syphony’. Yes one can purchase a caravan/lorry sat nav but that may not have what I want and is priced more than I care to pay over £300 and close to £400. My first model had to be returned due to software fault and got third degree before Halfords agreed to swap it. The second one took us in two loop routes in France getting stuck on left turns and up a slip road the wrong way plus attempting to take us through a farm track between vines, its a wonder it didn’t say ‘ At the next vine turn left’ had we obeyed, she who spoke’. I changed her to a fella at least he was clearer although did not state road names. Ours had to be backed up by a map book as it tried several times to take us on’ long way round routes’ and off main roads, the latter in mitigation it didn’t know I was towing my 26ft caravan. All in all as far as I am concerned its crap not fit for my use and over priced. Their is another facility with it for mapping out routes online Base camp, fine but you can’t download the routes to this model, not being able to do so burst my bubble of ‘How to get around way point problem’ went through with great difficulty a test route then found it could not be down loaded to this model sat nav to me that ‘rubbing salt in the wound’. I could put it stronger…oh what the heck, taking the wee wee! Had a wee dram so hopefully no spelling tismakes.